School is over and real summer has started. However, I was so busy that I did not have a time to pick up a pencil nor a brush to create a new image for a past few days. Next two days I will participate in The North Charleston Art Festival and teach little children “Origami”. So I will be not painting again. But I have a lot of ideas and am ready to go back to my eager self. 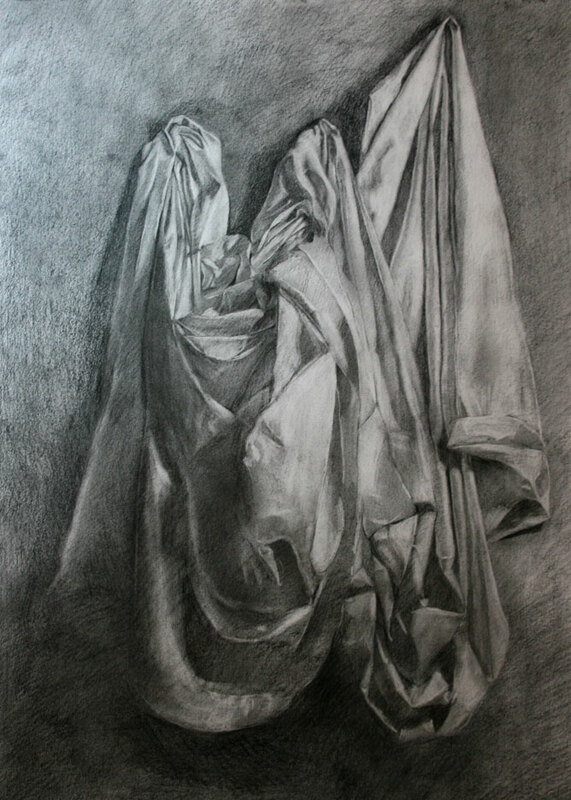 This is an image I drew as an example for the drapery project. Last week I posted another drapery which I did as an exercise. Compared with my exercise image, this one took a quite long time to finish. I probably stood in front of the hanged sheet for at least four hours. But I think that it turned out be nice. This entry was posted in Drawing, Still life. Bookmark the permalink. That is amazing!!! You are so talented!